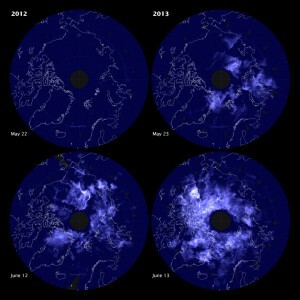 In 2013, the noctilucent – or night-shining – cloud season got an early start. NASA’s AIM spacecraft first saw them on May 13. The season started a week earlier than any other season that AIM has observed, and quite possibly earlier than ever before, said Cora Randall of the Laboratory for Atmospheric and Space Physics at the University of Colorado. The four data images show Earth’s upper atmosphere, centered on the North Pole, as observed by the AIM satellite. The image on the upper right shows noctilucent clouds on May 23, 2013; the upper left image compares the same week from 2012. The two bottom images show the extent of noctilucent clouds in mid-June of each year. The brighter the clouds in each image, the denser the ice particles. Areas with no data appear in black, and coastal outlines are traced in white. 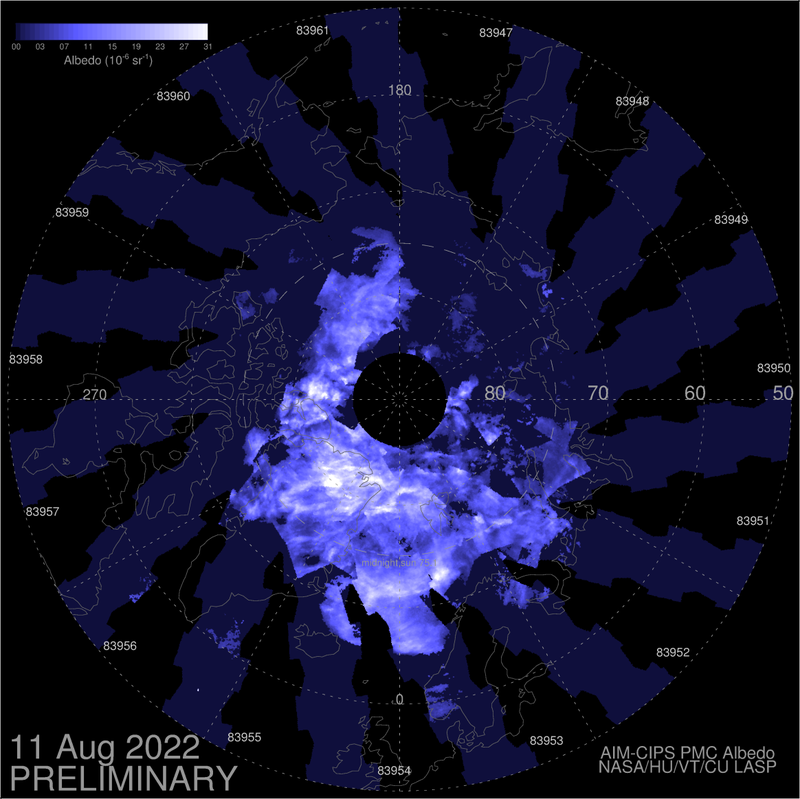 You can view a daily composite projection of noctilucent clouds by clicking here during the northern summer months. 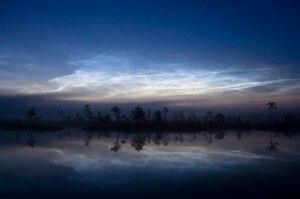 It turns out that meteoroids play an important role in the formation of noctilucent clouds. Specks of debris from disintegrating meteors act as nucleating points where water molecules can gather and crystallize. Ash and dust from volcanoes—and even rocket exhaust—also can serve their nuclei. See more about the AIM Mission at aim.hamptonu.edu.